The 10-year old elephant who had been presiding over the temple functions has now been sent to Mahalikudi to destress. The Samayapuram temple elephant who trampled mahout G Gajendran to death on Friday will be kept out of temple activities for three months, as directed by the Forest Department. The directive came after the Chief Conservator of Forests Yogesh Singh, senior officials of the forest, officials from the animal husbandry department and from the Hindu Religious and Charitable Endowment (HR&CE) department visited Mahalikudi, where the elephant is under observation after being shifted from the temple, according to reports. A team of veterinarians conducted behavioural tests on Masini to observe the stress and agitation levels of the pachyderm. No physical tests were conducted as Masini was highly stressed, according to the team. The elephant was taken to Mahalikudi with the help of mahouts from two different temples. She has been put on a routine diet and is also listening to a retired mahout. According to forest department officials, the ten-year-old, who had been the presiding elephant of the Samayapuram Mariamman temple, would be kept in an open space and efforts are being taken to bring more greenery into the place. In visuals that emerged moments after the incident, Masini could be seen repeatedly stamping the lifeless body of the mahout, moving around in circles within the main temple premises and dragging the mahout's body from side to side. A person can be trying to retrieve the body from underneath the elephant. 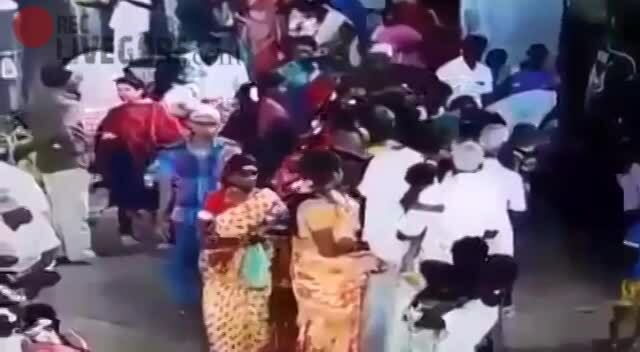 According to local news reports, the elephant was blessing pilgrims as usual in front of the prasadam stall inside the temple, when she suddenly pushed Gajendran, her 48-year-old mahout, off her back using her trunk. As Gajendran tried to bring her under control, she trampled him to death. Masini will now be at Mahalikudi for a few more weeks until it calms down fully.